Between Snow White and the Huntsman and now Ghost in the Shell, I have no doubt that director Rupert Sanders can craft some impressive visuals. Unfortunately, he also shows himself to be fairly uninterested in story and subtext, preferring to dazzle his audience without much attention to what the visuals represent. Although the first half of his new film leans into interesting notions about consent, control, and the female body, the second half reveals this subtext to be largely accidental. Instead, Sanders’ allegiance lies not with making his audience think, but instead giving them Scarlett Johansson in a skintight body suit and firing guns at a tank that’s being run by an evil corporate guy. Set in Tokyo at an unnamed point in the future where most people have cybernetic implants, Major Mira Killian (Johansson) works with the governmental division Section 9, a tactical response unit tasked with hunting down terrorists. The Major is a human brain (ghost) inside of a robot body (shell), and she’s told that in her past life, her parents were killed by terrorists and she barely survived the attack. One year later, and she’s trying to find Kuze (Michael Pitt), a terrorist who is hacking into and killing members of the Hanka robotics corporation. However, her investigation eventually leads to questioning her past and whether Kuze is her true enemy. For its first half, Ghost in the Shell works surprisingly well. 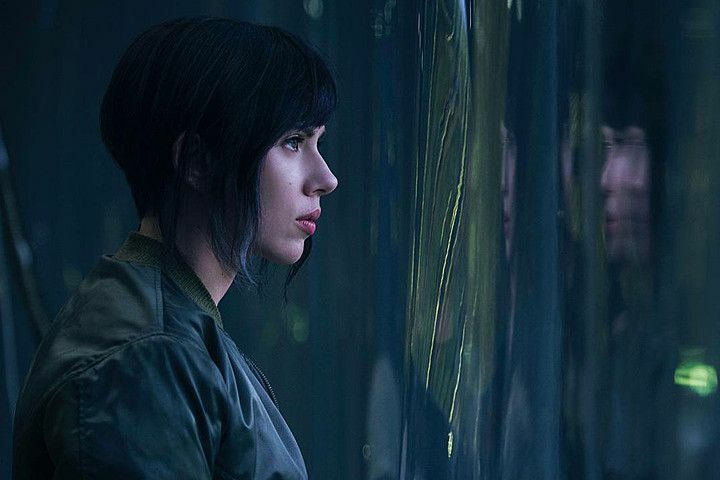 There are still some cringeworthy aspects like the fact that Johansson is playing a character who was Japanese in the original manga and anime, that she speaks English to her Japanese-speaking boss Aramaki (Takeshi Kitano), and that there are shockingly few Japanese people in the lead cast as well as in Japan. But I was able to push past this because the film was playing with some interesting notions regarding control over the female body. Inherent in the story is that The Major’s body does not belong to her. Her mind is supposedly hers (although she keeps seeing hallucinations, indicating glitches), but her body belongs to the Hanka Corporation, and the movie seemingly plays at Major’s level of consent. Is she property or is she an individual? And as we tend to see in most films that deal with robotics, the notion of humanity also comes into play. The movie feints at exploring these deeper themes within the framework of a noir-infused sci-fi crime thriller as Major and her partner Batou (Pilou Asbæk) hunt for Kuze. But as the mystery starts to unfold, Ghost in the Shell heads in a far more unsettling and disappointing direction. 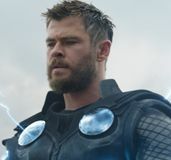 The whitewashing comes to the forefront, and the film’s flaws can’t be covered up by meaningful subtext and lush visuals. Instead, the movie becomes content to just have Major uncover a corporate conspiracy, fight against the corporate bad guy Cutter (Peter Ferdinando), and save the day. Rather than trust the audience to delve into the themes that are being presented, Ghost in the Shell retreats to mindless set pieces. It’s also revealed that Cutter’s motivations don’t make a whole lot of sense. For the Hanka Corporation, Major represents the next stage of human evolution, a way for people to basically become eternal if they just keep moving their brains into new, cybernetic bodies. He keeps ranting that Major is a valuable investment, but if that’s the case, why wouldn’t Hanka want to study her and keep her safe as opposed to sending her out to where she’ll be shot at on a regular basis? I kept expecting for Aramaki to say something like, “Because the government invested in your company and we decide what to do with your products,” but that never comes so Cutter just ends up looking like a total dummy. 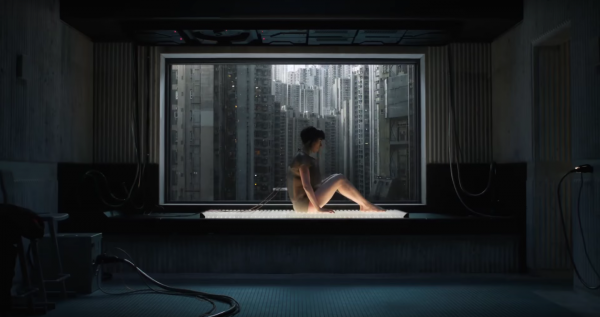 When the full picture of Ghost in the Shell comes into view, a depressingly soulless film comes into view. The movie is packed with neat visuals, but so is a DeviantArt page. The story wants credit for presenting humans melded with cybernetic and then asking, “What does it mean when we cede our bodies to machines,” but refusing to really engage with those ideas. In a better film that explores Major’s ownership of her own body from start to finish, a scene where she’s assaulted in a nightclub has meaning. But because the script doesn’t have the wherewithal to thoughtfully explore that subtext, it becomes an icky scene where Major essentially blends a pole dance with kung fu. It’s a movie that would like credit for being deep and thoughtful when it’s clearly just an empty shell. Ghost in the Shell opens March 31st.